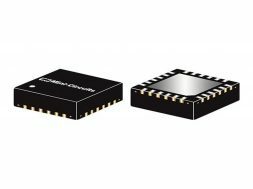 The CMA-83LN+ is a PHEMT based wideband, low noise MMIC amplifier with a unique combination of low noise, high IP3, and flat gain over wideband (0.5 to 8.0 GHz), making it ideal for sensitive, high-dynamic-range receiver applications. This design operates on a single 5V or 6V supply, is well matched for 50 ohms, and comes in a tiny, low profile package (0.12 x 0.12 x 0.045”), accommodating dense circuit board layouts. The amplifier is bonded to a multilayer integrated LTCC substrate, then hermetically sealed under a controlled Nitrogen atmosphere with gold-plated cover, eutectic Au-Sn solder, and Ni-Pd-Au termination finish. CMA-series amplifiers have been tested to meet MIL requirements for gross leak, fine leak, thermal shock, vibration, acceleration, mechanical shock, and HTOL.